I'm not saying this Congress is bad at its job. 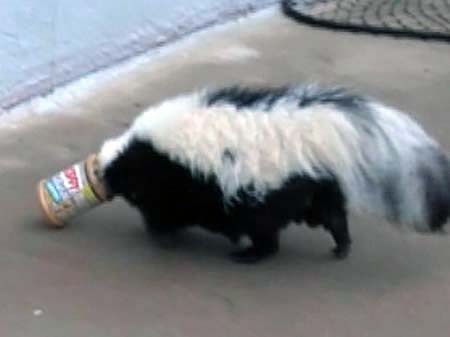 I'm just saying that this Congress is equivalent to a skunk with its head stuck in a jar of Skippy peanut butter. Recent late-night political jokes, from Daniel Kurtzman's Political Humor Blog on About.com. President Obama may have to cancel his 50th birthday party because of the debt limit crisis. The Republicans won't even let Obama raise his age. Democrats warned that if the debt ceiling isn't raised, the government would cease to function. How would you be able to tell? The government is one week away from running out of money to pay its bills. So basically, our nation has become Nicholas Cage. Iowa Congressman Steve King says that if the country falls into default, President Obama could be impeached. Obama could stop that with three words: President Joe Biden. Speaking of the debt crisis, I read that if the U.S. debt were stacked in $100 bills, it would be as long as two football fields and as high as the statue of liberty. You know, just in case $14 trillion didn't seem like a lot to you. Rumor has it that Lindsay Lohan and Paris Hilton are friends again. There you have it. Lindsey Lohan and Paris Hilton are now more mature than President Obama and John Boehner. John Boehner told Republicans to 'get in line.' He was very angry. His face turned from orange to mandarin orange. They say that the United States might default on its loans and China might foreclose. We'll have to move into a cheap rental country or something. Sarah Palin said that if a deal isn't reached by August 2, nothing will happen. Do you hear that, award-winning economists? The government is less than a week away from not being able to pay its bills. We may have to move in with Canada for a while. We are over $14 trillion in debt, but the 'feels like' is $20 trillion. We're under a heat dome, and meteorologists believe it's due to Michele Bachmann's hair spray. Jeb Bush is toying with the idea of running for president. Well, I'm toying with the idea of drinking again. The number one movie in the country is "Captain America." Analysts say this movie is successful because it takes place in the 40's and has a retro feel. The film takes audiences back to a time where America could actually fight a war and get out of a depression at the same time. According to a new poll, President Obama is losing support from his own party. To give you an idea how bad it is, today Jimmy Carter compared him to Jimmy Carter. Economists are worried if we fall into default "the good name of the United States" would suffer in the eyes of the world. Oh, shut up. We lost that fight the day we sent the cast of "Jersey Shore" to Italy. Manchester United is the most valuable sports franchise in the world. A few years ago, it was the target of a takeover by Captain Evil himself: Rupert Murdoch. Murdoch was going to buy Manchester United for less than he usually pays for a prime minister. I had no idea that life for conservatives was so difficult in this country. Tell me a little bit, if you would, about the bad people holding your kind back. [Video overlay] Sean Hannity saying liberals are "so vicious, so mean, and so cruel, and I don't hear this coming from conservatives about liberals." Jon Stewart: "You don't? That is, if I may say, some of the most free-range, organically grown disingenuous, ideologically marinated, un-self-awareness I've ever seen in the wild." Is it so wrong we want pundits vetted? I want to get my news from news people, not random people with an AOL account.